It’s been a while since I took a look at three Virtual Machine packages for the Macintosh, and all three have moved on from the previous versions. Parallels has recently seen a step to version 4, VMware Fusion is now on version 2 and so is Virtualbox. With the release of Parallels came claims of big speed improvements so it’s time to try all three again and see if one has edged ahead of the pack. Do mac users need Antivirus? I posted a while back on the various Antivirus apps available for the Mac. Anyone interested in an update should have a look at the article on Macworld that looks at the threat and makes some interesting points. And don’t forget that Windows running in a virtual machine (using VMware, Parallels or the free Virtualbox) is still Windows so needs protection. One of the comments left after the article raised a good point, why hasn’t there been a major security breach of Mac OS X? Now that the Mac’s market share is growing there would be a lot of publicity for whoever writes the first widespread security threat, so where is it? is this luck, or is Apple doing something right? Macs surprise me sometimes, and my hackintosh even more so. It could be a simple way of doing something that just makes sense, or something you would never believe was that easy because other operating systems make it so hard. Occationally something happens that I wasn’t expecting at all. I just had one of the later. After much time spent searching for solutions to the missing SMB shares in my Mac’s network, they just appeared. A while back I compared the three biggest Virtualisation products for the Mac. Parallels, VMware Fusion and VirtualBox are all impressive products that performed equally, and I used the free Virtualbox for my occasional Windows needs. Parallels was part of the recent MacUpdate bundle which I bought, so I’ve been using that most recently. It’s been running well and seems more responsive than the previous versions I tried. The reason for this recap is that VMware Fusion 2 beta 1 has been released, and adds some interesting new features. Multi display support will please some users, even if support for eight monitors is very niche. Importing Parallels and Virtual PC machines is a useful if late addition. DirectX 9.0 Shader Model 2 is perhaps the most interesting, and I’m wondering how well this will work on my hackintosh. Perhaps the biggest improvement is that version 2 allows any printer attached to your Mac to be used direct from Windows without installing drivers. Note that we are planning to address all known issues. Things are certainly moving on in the Mac virtualisation market, so I’ll be trying all three products again this week with some updated results to follow. I’ve been toying with VMware Fusion and Parallels for a while now trying to make up my mind which one to settle on, and the decision just got a lot easier. Innotek’s Virtualbox is another X86 virtualiser, with the big distinction of being free. Innotek have just been aquired by Sun Microsystems, so it looks like there won’t be any shortage of funding. I’ve been playing with the latest Beta 3 for OS X hosts, and for a beta product it’s pretty smooth. There are virtual machine additions just like VMware and Parallels so you can freely move the mouse cursor out of the window, and dynamic window resizing is supported. An impressive list of supported guest operating systems including all flavours of Windows from the past 18 years, OS2, Linux 2.2,2.4 and 2.6 kernels, BSD’s, Netware and Solaris. One of the things I wasn’t expecting was support for hiding the windows desktop so only application windows and the taskbar show. 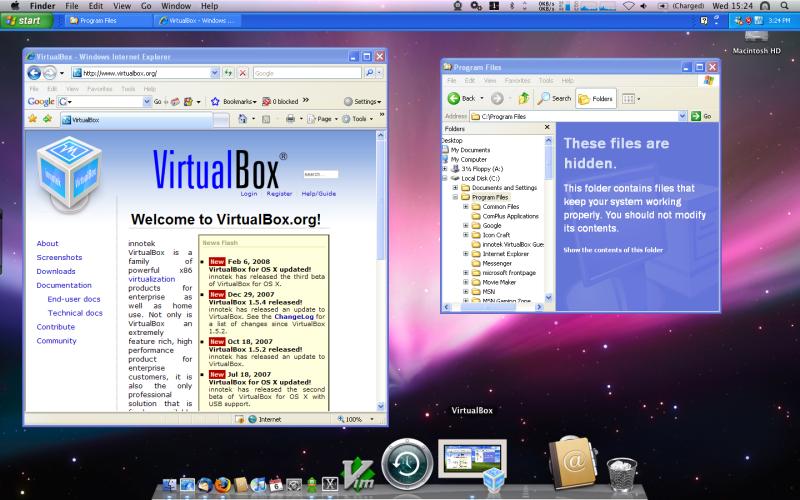 It’s called seamless mode in Virtualbox, and operates in the same way as Parallels Coherence and VMware’s unity. This is looking like an impressive product for all my virtualisation needs, so if testing continues as smoothly as it has so far I won’t be needing anything else. Next up is some benchmarking using geekbench so I will post again when I have the results.